I am on my last Pantone Fall 2018 post. I hope you have enjoyed seeing these colors and the way I have managed to put outfits together using the inspiration from the 2018 Fall palette. As in anything where fashion is concerned we can take it our leave it. Fashion is for you. It is about putting together outfits and colors that you like, make you feel confident and that you will enjoy wearing. In some ways what we wear is like our second skin. It provides a covering for a bodies and how we put that cover together can boost our self-image and help us better manage our wardrobes and our pocket books. I have found, in the fashion realm, just like in cooking, having a source of inspiration really helps. Whether you follow a recipe or cook from memories of you and your mom or grandmother working together to make wonderful creations in the kitchen, you use that inspiration to put food on your table. In the same way inspiration for fashion can come from magazines, bloggers, color palettes or even things out in nature. That is the reason I always like to use the Pantone color palettes as a spring board for creating fun and interesting outfits. These last two colors, Quetzal Green and Crocus Petal, I decided to pair, once again, with Meerkat. Crocus Petal is a lighter, more spring like color found on the London palette. I feel that pairing it with Quetzal Green and Meerkat was the perfect way to keep the light color grounded and more fall like. This top is a Kohl’s clearance find and is Dana Buchman brand. It is a button up with 3/4 length sleeves and a longer silhouette. It has some stretch and is more fitted. I opted to wear this bead and metal statement necklace, which incorporates the Crocus Petal color as well. I wore a simple gold cuff on my arm. I found the open weave sweater thrifting, I love the variations in the knit. I am not a yarn girl, though I would love to be. I think this is crocheted, but it might be knit. Can any of you readers tell? Whatever it is I love the different stitch sizes and open versus more closed aspect to the piece. Here we are talking about texture again and how essential is is to making an outfit more interesting. I thought these two colors when great with the browns, black and cream of my leopard print pencil skirt. This skirt is another JC Penney find and is Worthington brand. The boots, Aerosoles and bag, both thrifted were the perfect accessories to pair with this outfit. I think black would have worked well or even a cream colored boot, which are trending right now, but I love the luxe feel of the Meerkat color. Next week I’ll have a recap of all the Pantone Fall 2018 colors. I hope you’ve enjoyed this series and that it provided you with some inspiration for trying new color combinations. Always shop your closet before going out to purchase what is currently trending. You might already have a leopard print top or the perfect color piece that matches with one of the Pantone seasonal colors. I’ve included a few shopping links. These are affiliate links. All opinions are my own. Of all the colors on the Pantone Fall 2018 palette, I felt Limelight and Mellow Rose were the least fall-like colors. Once again, I had to think outside the box when pairing these two light pastels together, to make the outfit seem more in keeping with a fall theme. In order to do this, I thought it would be best to pair them with Pantone’s classic color, Meerkat. Meerkat is a warm, orange brown and while it could be used in any season, It makes me think of fall leaves, bonfires and warm apple cider. 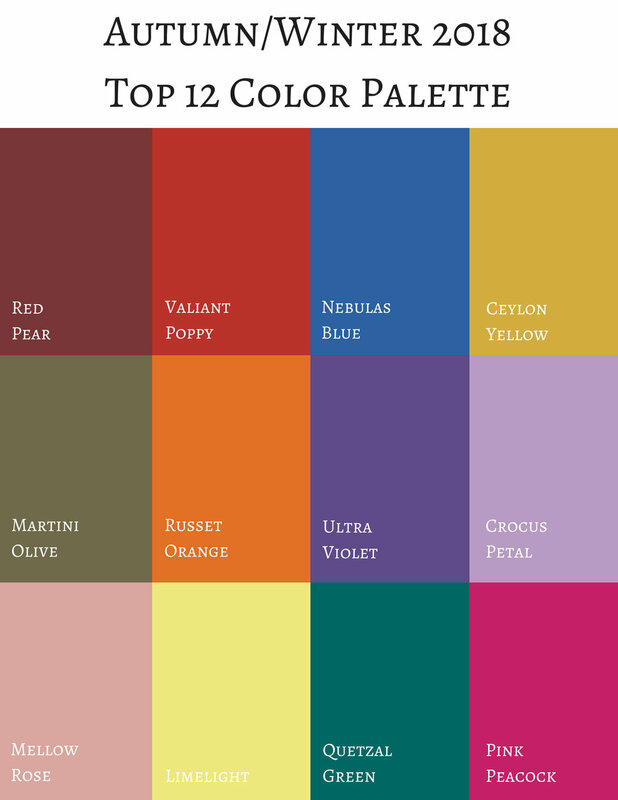 Mellow Rose is actually one of two colors that is only found on the London Palette. I am not sure why they added this and Crocus Petal, the two extra colors on their palette, but they are light, airy and more spring like. Maybe it was an attempt at bridging the gap between the seasons and reminding people that the old rules are gone and colors are seasonless. All of the pieces in this outfit were thrifted except the bag and the boots. The Limelight colored jeans are Talbots brand and are really an ankle pant that I rolled up, so they stop at the top of my boots. The Mellow Rose button up is Izod brand and the long fringe knit vest is a brand called Sun and Shadow. I’ve styled this vest several times before. You can see those posts here and here. I don’t remember where I got the belt, but I thought it tied in with the boots and bag quite well. I just did a front tuck with the shirt. This bag I got at Meijer and I am not sure of the brand. It is a nice cross body bag and the embroidery on the front adds interesting color and texture. I think this can be used for all seasons. These boots are a brand called Sugar and I got them at Kohl’s a few years ago. They are made of a suede type material and add a different look to an outfit because of the single, long, wrap tie. I just added a simple bead and metal necklace and a bracelet for jewelry. This might be fun with a scarf or even some layered necklaces for a more bohemian look. Here is a full length view of the vest from behind. This is the second outfit in this series that I am not completely happy with. These colors are great, just not necessarily together, or for the season of fall. I know, I know, we can wear whatever, whenever, but if I’m not happy with it, then I’m not going to wear it. I’ve worn both of these pieces in the spring and summer. My color leanings are more bold and bright, but if you are a pastel kind of girl, then follow my friend Liz at With Wonder and Whimsy. She loves pastels and wears them all year round! That’s all for today. Hope you are having a great Tuesday! Once again, I am visiting the Pantone fall color palette. If you are unfamiliar with the Pantone Institute of Color, they are considered to be the leaders in color technology. Here is a quote from the About Us portion of their website. There are two major cities in the fashion industry that put out their corresponding color palettes for each season. The graphic below shows a combination of the New York and London Fall palettes. This year’s fall palette is a blend of traditional seasonal hues, soft pastels and pops of bright color making for an interesting color mix. You could pick one color from this palette or all of the colors and when combined with other seasonal trends such as animal prints, plaid and camo make amazing outfits that go beyond our normal expectations for fall. In addition to the twelve colors above, last spring Pantone also began putting out a classic color palette. 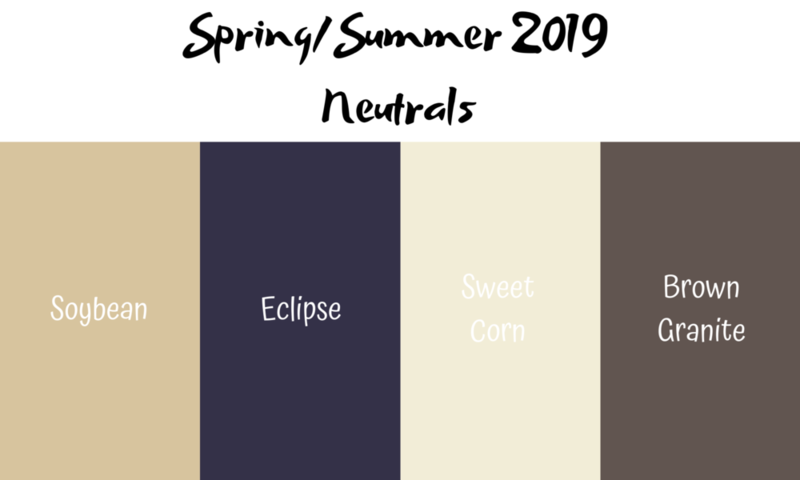 While these colors remain more neutral and unchanged, thus the classic descriptor, they present an option for what I call a “grounding” color for our outfits. While some people like to wear color on color, others like to have small pops of color with a more classic foundation to keep their outfits grounded and impeccable. Next week, I will begin showing you how I put these colors together to form outfits that are both classic and colorful. For now, here are few sneak peeks. I hope you’ll join me then. It is time for another Ordinary Amy post. When I started thinking about this column, I thought it would be fun to let you see a little bit more of who the regular, normal, Amy is. Sometimes, bloggers look as though they have it all together and life seems like a continuous stream of happy thoughts, great outfits, travel, meet ups and food. However, I am an actual woman and I live real life. I like clothes that are easy and comfortable, have always been a jeans sort of girl and don't usually take pictures of my food. If I had done so this morning, you would have seen a small bowl of dry Cheerios! Ha, ha. This virus, has my appetite a bit wonky as well. Oh well, this too shall pass! I found this lace hoodie a while back at a thrift store and fell in love. After all, what is better than the comfort of zip up hoodie made with a soft lace fabric that makes it look elegant and classy. I've styled this lace hoodie on the blog before. Check out that original post here. When I was growing up my mom and a number of her sisters used to crochet doilies, and other lace decorative items like toppers for dressers and lovely table clothes. Maybe it was those pretty pieces that fueled my fascination with lace, but for some reason I have always loved lace. Maybe it is my inner romantic or my writer's mind that associates lace with epic tales of love, magic and danger. I have always liked the look of a wedding gown that has lace, at least in some form or other on it, as well as curtains or shears made with lace designs. While we have long associate lace with women's underwear and bridal veils, I like that lace is now taking front and center stage on the fashion scene as a functional, wearable clothing piece. You can see the all over lace design on this piece has a floral pattern. While lace can come in many patterns and be made today from many different materials, all of them have the quality of being woven or sewn in an open web-like fashion. That is part of what makes lace so beautiful. To me, lace is like art work for the body. Here is a Wikipedia article that gives a bit more information on the different ways of making lace and its early origins. For this look, I wore the jacket over my Greenery Merona popover blouse. Remember, Greenery was the Pantone 2017 color of the year. I like this green color as it is more of a true green rather than a yellow green or a blue green. I also wore my Rock & Republic jeans from Kohl's. This particular day from a number of weeks ago, we were just running some errands. I still like to try to look put together, so I threw on the silver and bead necklace and the green bracelet. Since I was going for ultra casual I chose my SO ankle boots and my green velvet bag. 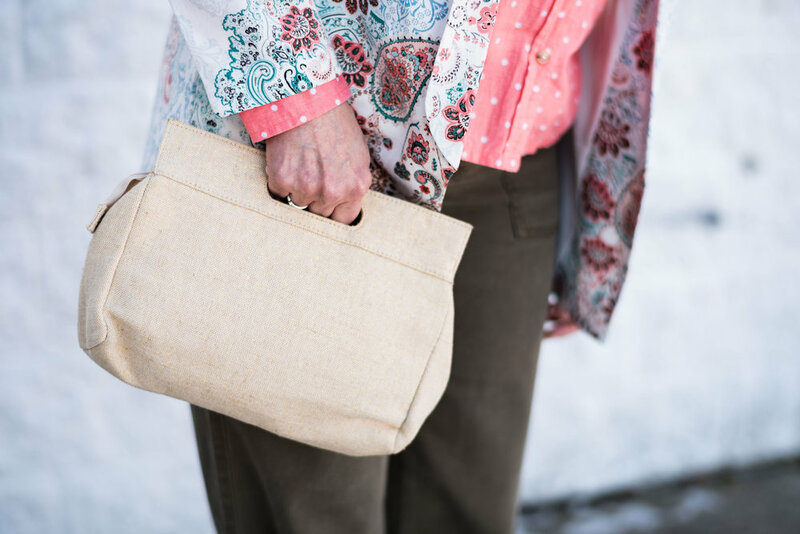 Even though the weather is warming up, I think this pretty green bag with its blue flowers is perfect for spring. If I can wear lace as clothing, more than just underwear, then I can also carry a velvet bag all year round! Do you have any lace pieces like that, that you love to wear? I'd love to hear your comments. I've included a few shopping links below to pretty lace items that would be perfect for spring or summer. Take time to click on a few. Each of your clicks earns me a few pennies. This post contains affiliate links. All opinions are my own. We are moving right along in our Pantone Spring 2018 color series. For those of you who may be new to my blog, the Pantone Color Institute are the go-to entity for fashion and design color choices. Twice a year, spring and fall, the Institute puts out a palette of colors, from which many designers find their color inspiration. As a blogger, who loves color, I enjoy building outfits around these colors as well. This week, I am featuring two of the colors from the London Palette along with the foundational color of Warm Sand. Say hello to Spiced Apple and Nile Green. As I said, last week, the last three posts for this spring series will feature indoor pictures. My daughter and I finally gave up on the snow that was falling fast and wet on the day we took these photos. Spiced Apple is a brownish red, bordering on maroon. My skirt might be a tad dark, but you get the idea. This faux leather skirt is a fun, thrifted piece that I have found to be quite versatile. This one is Worthington brand. I topped the skirt with another thrifted piece. This floral, ruffled, bell sleeve blouse is a brand called Sunny Leigh. The blouse contains snippets of Nile Green and I thought it went well with the reddish brown skirt. I added a beaded necklace that also was the Nile Green color. I threw the Warm Sand open weave vest over the top as my grounding color. I feel the vest not only adds a layer of warmth for these chilly spring days, but also adds textural interest. The bag I am carrying is a bit more yellow than the Nile Green, but it works with the outfit as a whole and without having the color tab right next to the bag, you wouldn't be able to really tell. You've seen these cobalt blue heels before on the blog. They go perfectly with the darker shade of blue in the top, so I thought they would be a good pop of color to complete the outfit. What do you think of these colors? While I do like both colors, I would not say these are my favorites. Nile Green is a tad light for my taste and the Spiced Apple is a color I would fee better in, come fall. However, it is fun to try out these different colors, because you never know when one of them will strike you in a way that makes you fall in love with it. I've included a few shopping links. These are affiliate links, which means if you click on a link, I get a few cents. If you purchase something through one of my links, I get a little commission. All opinions are my own. Monday linking up with Catherine of Not Dressed as Lamb. Tuesday linking up with Shelbee of Shelbee on the Edge and Jess of Elegantly Dresses and Stylish. This spring, the Pantone palette is full of pastels. Both the New York and the London palette have a number of overlapping colors that instantly say spring. I am excited about introducing this series to you and even though the colors have been on the Pantone website since last fall, I feel that the end of February and beginning of March are the perfect times to introduce spring colors. I'll confess, up until a few days ago, I couldn't even think about spring. As much as I want it to be here, I know there are still cold days ahead. However, with a forecast of temps in the forties and fifties, I think I can finally blog about spring, knowing that it will soon be here in all of its splendor. Cherry Tomato - an orangey red described as "...impulsive....demanding attention...courageous..."
Blooming Dahlia - a peachy salmon.."subtly alluring...with understated appeal." Meadowlark - a pretty yellow, described by Pantone as "glistening with joy and illuminating the world around us." Pink Lavendar - lavender with a little more pink and a little less blue. Described as, "..soft and romantic...that charms with its soothing sense of quiescence." Ultra Violet - Medium purple with a "complex and magical" hue. This is Pantone's choice for Color of the Year. Almost Mauve - this ultra light blush is perfect for using as a neutral and pairing with any other color. Lime Punch - appropriately named, this color makes me think of citrus fruit and warm sunny days. Little Boy Blue - the color of sunny skies and a feeling of "expansiveness". Chili Oil - think spicy for this deep reddish brown. Arcadia - a green with blue undertones, reminiscent of tropical waters. Emperador - a rich chocolate brown. Spring Crocus - described as a "...witty and flamboyant...fuchsia shade...."
Palace Blue - not quite royal, but "...sparkling with energy...."
Ash Rose - a more earthy darker pink. Nile Green - reminiscent of sage and honeydew melons. Spiced Apple - similar to Chili Oil, but with a deeper brown. Rapture Rose - a pinky red "...that brings flirtatious charm to the Spring 2018 palette." Sailor Blue - dark navy. Harbor Mist - light to medium gray. Warm Sand - tan with more yellow tones. Coconut Milk - white to off white. The following photos are some sneak peaks at my series that will start next week, where I will feature outfits using two or three of the palette colors as well as a classic color. I hope you'll join me next week as I begin my Pantone Spring 2018 series. Check back on Thursday for my Old Becomes New column. Monday linking up with Catherine of Not Dressed as Lamb. Tuesday linking up with Shelbee in The Spread the Kindness link up and Jess of Elegantly Dressed and Stylish. 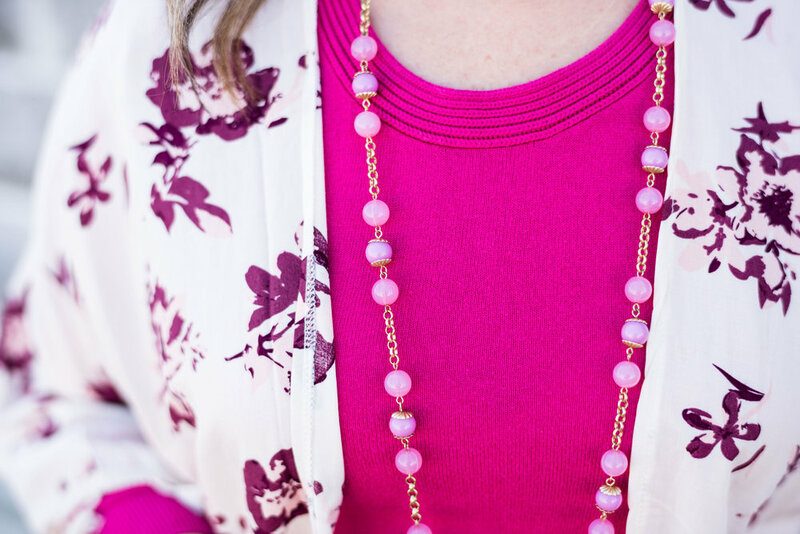 Friday linking up with Nancy of Nancy's Fashion Style. This fall, the color institute known as Pantone published their usual ten color New York palette. However, this year they also published the ten color London palette. So what is a fashion blogger to do? Why, feature all twenty of these colors. Don't worry, I won't be featuring one color a week for the next twenty weeks. That would take me into January. Ha, ha. For this series on the Pantone colors, I will be combining two colors a week. There are a few colors that overlap on both the London and the New York palettes, and many of the colors while having different names are very similar hues. I decided to start the series with the London colors. The graphic above and below was put together by Rebecca, my photographer, web helper and daughter, using Pantone's color coding. The way you see the graphic will be the way I pair the colors. For example, Flame Scarlet will be paired with Otter, Primrose Pink with Navy Peony and so on. You might wonder what got me interested in the Pantone color palettes in the first place. I love color. I love flowers in the summer, changing leaves in the fall, orange pumpkins at Halloween, Christmas lights at Christmas and the soothing colors of nature such as a blue sky, green trees and red cardinals. With my propensity toward color it was only natural when I became interested in fashion that an interest in fashion color choices followed. Pantone is the fashion and design industry's go to for color choice. I am not sure what the whole process looks like, as far as how they come up with the colors for each season and how those translate to fabric versus paint or graphic design, but if you start paying attention to the Pantone colors, all of a sudden you will begin to see those colors in the new season's line of clothing, home furnishings, graphics and even architectural designs for offices. Here are some sneak peeks at what I have coming up, starting next week, with the Pantone Fall 2017 London color palette. You can probably tell from looking at the graphic that this was not the easiest grouping of colors to work with. There are lots of pale colors as well as yellows which many people cannot wear. This palette was definitely a challenge, but I find that even more fun. Besides, it is helping my brain stay active to try to figure out how to combine pieces and colors in a ways that will be pleasing to the eye. I hope you will join me the next five Tuesday's for my Pantone Fall 2017 London series on the blog. Thanks for stopping by! Be sure to check back on Thursday to see who my Beautiful Blogger Bests choice will be. Until then have a great Tuesday. Monday linking up with Catherine of Not Dressed as Lamb. Tuesday linking up with Shelbee of Shelbee on the Edge, and Jess of Elegantly Dressed and Stylish. Wednesday linking up with Hannah and Sara of The Perfect Storm.